The holiday season is all about gathering family and friends together. But hosting any kind of holiday gathering means stacking a lot of items on your plate during an already busy season, taking the fun out of the festivities. With a little planning and the right attitude, you can pull off a fantastic event and enjoy being the holiday host or hostess. Author and television host Katie Brown understands that when it comes to hosting a gathering – especially a holiday event – success is in the details. Here she shares her top five tips to help you entertain with less stress and more holiday spirit. You don’t need to create an over-the-top, gourmet feast that keeps you slaving in the kitchen. Choose dishes that you can make several days in advance, and then pace yourself. Soups, casseroles, marinated salads and some desserts taste even better when they’ve had time for their flavors to fully blend. When people are having a good time, spills are bound to happen. But it doesn’t have to ruin your holiday cheer. If an accident happens, you can help prevent stains from setting in by using a stain remover product like OxiClean® Versatile Stain Remover, which is chlorine free and color safe. You don’t need a total room makeover to create a holiday masterpiece. Just think color, pattern and texture. For example, fill vases or bowls with cranberries and sprigs of evergreen, or fill baskets with red apples, or jars with candy canes – the more sizes and shapes the better. Decorating is all about editing what you already have. For a chic holiday centerpiece, look for trays, ribbons, books and ornaments, and even leaves and branches from the yard–– they can all be used to help set a lovely table. Also important is to make sure your dishes are sparkling clean. According to a recent survey from the makers of OxiClean®, 88 percent of respondents admit they are embarrassed to serve food on dishes that are cloudy or have spots. To ensure dishes are sparkling clean, use a booster such as OxiClean® Dishwashing Booster in your dishwasher, so you don’t have to worry about embarrassing spots or film that detergent alone can leave behind. For more ways to keep the sparkle in your holidays, visit www.oxiclean.com. Give your younger guests a handmade souvenir. Set up a cookie station with sugar cookies, frosting, colorful sprinkles and toppings, so they can decorate their own dessert. You can also set up a small craft table and let them make ornaments to take home and hang on their trees. 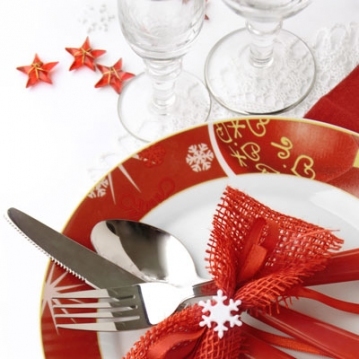 Make the most of your holiday entertaining by keeping things simple.